THEY may only represent a pin-prick on the sprawling King’s Cross redevelopment site – as our graphic shows – but, to conservationists at least, the Stanley Buildings are a big part of area’s rich industrial heritage. A prize example of tough Victorian architecture, they were built to stand the test of time – but not a wrecking ball. Within the next few months, if not weeks, the listed buildings, which campaigners fought so hard to protect, face demolition. The New Journal can now reveal the see-saw negotiations between Camden Council and Argent Limited which saw them fall into the developers’ clutches. A top-secret report which senior officials at the Town Hall were desperate to keep private shows how Camden surrendered possession of the buildings in a £3.35 million deal. Property experts still claim that the real value to buyers Argent was closer to £7 million because it had no intention of refurbishing them as flats and instead planned to demolish them to maximise the value of the site. A complaint over how cheaply the buildings were sold for – and the fact that they were never offered on the open market, particularly to housing associations that might have created inexpensive homes – has since been filed with the local government ombudsman. Realistically it is unlikely to be resolved before Stanley’s date with the bulldozer. Argent plan to reduce the northern building to rubble, realign Pancras Road and create a lucrative link-up to more blocks of offices and a healthcare centre – a site estimated by Camden to be around 8,890 square metres. The original use of the Stanley Buildings as affordable housing will be lost in the change. The so-called pink papers – a council report circulated among members of the Liberal Democrat and Conservative cabinet before it agreed to the sale – are meant to be confidential but have been now seen by the New Journal. 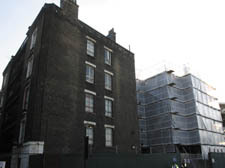 Report author Mike O’Donnell, the most senior civil servant in Camden’s finance department, said Argent had initially only offered a nominal fee for the buildings, an opening gambit scrutinised by the council. Even though the plan was to knock them down, the developers, Mr O’Donnell said, cited the cost of refurbishing the dilapidated buildings as being too costly. More significantly, Argent’s had estimated its road realignment plan would cost £5.2 million and did not want to splash out too much extra money. Camden’s own hired surveyors estimated the value of Stanley at £200,000 to the Town Hall because of the disrepair but advised that Argent, as a special purchaser, would pay more because it needed ownership to follow through its redevelopment plans. Camden did not consider opening the sale to the open market after that advice. Officials, realising the site’s critical position, asked for a share of the revenue that would be created by Argent’s redevelopment. But as negotiations failed to reach a conclusion, Mr O’Donnell said Camden was tempted by an offer of around £2 million and a bonus payment of £1 million – known as an “overage” payment. Mr O’Donnell confirmed that Argent came up with their final offer in December – later approved by senior Lib Dems and Conservatives.